What did Mamarazzi bought from Pasar Malam? Nope. It's Pulasan. 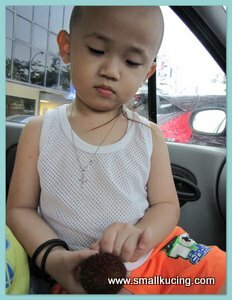 Adik-beradik to Rambutan gua. Just like its name, just need to "pulas"(Twist) and the skin will open. Well, into the blender they goes with some cherry tomatoes. I just saw this "rambutan" at the fruit stall yesterday. Quite sweet. ya la...last time used to eat the asamboi ice cream 20sen each. Now tarak lo. 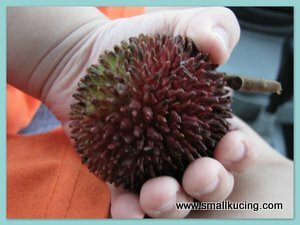 At once i really thought it was rambutan,,,,, hey small kucing,next time uncle eugene go KL and find you, you must keep some more me ok or not? Hahahahahahaha!!!! I like your face in the last pic. You're such a natural! Have not tried a pulasan before and blueberries most of the time that we get here is sour. I am trying get some good ones to bake some muffins soon. Nice ice-cream potong, I always buy more and then enjoy it while watching tv. 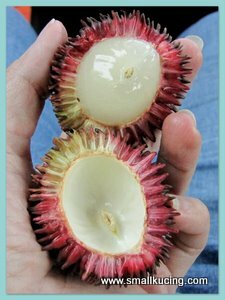 i hvn't tasted that 'rambutan' before. YUM, I like pulasan! I prefer cherries, much sweeter and taste better thn blueberry.... blueberry shall reserve for making dessert, hehe. Ha...that is a good thought..rich in vitamin C.
His expression is so cute! 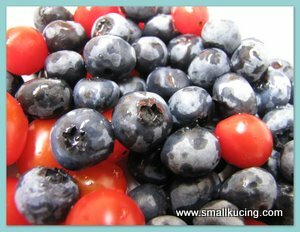 Didn't know blueberries can be mixed with cherry tomato to be made into icecream potong, nice!